Summer days are sunny days, so why not enjoy them? There is no better feeling than throwing opened your blinds and letting natural light fill the rooms of your home or storefront. Even a little bit of natural lighting can go a long way but it can go even further when coming in through a clean window. The windows around your property do more than supply a view. Small or large panes of glass spend all year collecting organic debris, streaks and stains. 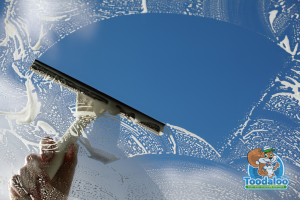 Don’t spend another day staring through clouded glass when our window cleaning can take care of it for you. More so than being visually unappealing, dirty windows have a negative impact on the condition of the glass itself. Even though it is not yellow and squishy, glass is a porous material, like a sponge. These two items might work in different ways, but the concept is the same: opened pores absorb environmental materials around them. For a sponge, it is water and for windows, it is organic debris. Once foreign materials begin to seep into the pores of glass, the material itself begins to weaken. Weakened materials are at greater risk of breakage, need of repairs and can lead to drafts, impacting household expenses and bills. Why bother dealing with the worst-case scenario when you can call a Gorilla instead? Our window cleaning services help extend the lifespan of your windows through proper routine maintenance. Even if you realize that your windows are in need of a little TLC, it is hard to know how to get the best results. While some theories about particular cleaners or cloths might contain a bit of truth, only professional tools and techniques will get your windows sparkling. Our Gorillas use rubber squeegees and eco-friendly cleaning solutions to clear each nook and angle of your windows while eliminating static electricity that draws airborne dirt back to the surface. With the help of water-fed poles and training, our Gorillas are able to clean windows up four storeys high. No matter the style of your property, our Gorillas can assess and treat your windows, so why wait?